Piermario Morosini (5 July 1986-14 April 2012) is an Italian footballer who plays as a midfielder last for Livorno, on loan from Udinese. On 14 April 2012, the Pescara-Livorno match, Morosini heart disease and died. 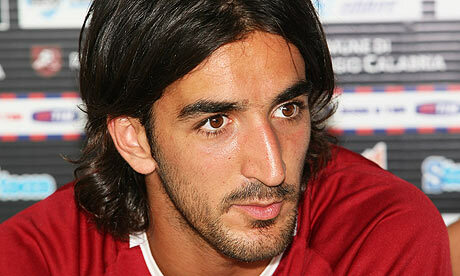 Piermario Morosini was born on July 5, 1986, in Bergamo, Italy. Camilla's mother died in 2001, when he was fifteen years old. His father, Aldo, died in 2003, followed shortly after by a relative defect, leaving him alone with a disabled sister. Shortly after the death of his parents, Morosini said that "this is the thing that changes your life, but at the same time make you very angry and help you achieve what is also the dream of my parents." Morosini scored two goals during his career from 2001 to 2012, which for Italy U-17 and to Vicenza. Morosini started his career at hometown club Atalanta, and sold to Udinese in the joint ownership agreement in 2005. On October 23, 2005 he debuted in Serie A at Udinese-Inter match, collecting a total of five appearances in this league. In the 2005-06 season he also debut in the Coppa Uefa at Levski Sofia-Udinese game. Udinese got full ownership of Atalanta in 2006, and loaned to Bologna to gain experience. From 2007 to 2009 half of the registration rights are farmed to Serie B club Vicenza Calcio. On August 31, 2009, Morosini was signed to the newly revealed side Reggina on loan. On February 1, 2010, he was loaned to Padova Calcio. In June 2010, the club decided not to buy it immediately. In January 2011 he moved on loan to Vicenza and played 15 times for this club. On January 31, 2012 he was loaned out to Livorno played eight games. Morosini made ​​his international debut for the U-17 team in September 2001, at only 15 years old. On September 2006, he made a U-21 debut and called-up for the 2009 European Championships as a backup.